The more we look, the more we realize how profound the vision of an enlightened society — in which each person’s basic goodness is recognized — is, how challenging it is to manifest, and how urgent the need to bring it forth in its most radical expression, here and now. How can we find relationship with the very fears that denies us a seat in the unshakable confidence of our basic goodness, separating us from our selves and others? In March, angel Kyodo williams gave a brilliant Wednesday Dharma Night presentation to the San Francisco Shambhala Community. Below is a recording of her talk. We hope you find inspiration in her words. Called “the most intriguing African-American Buddhist” by Library Journal, Rev. 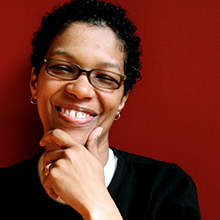 angel Kyodo williams has been bridging the worlds of spirit and justice since her critically acclaimed book, Being Black: Zen and the Art of Living With Fearlessness and Grace, which signaled a shift in the perception of American Buddhism as all white and upper middle class. Now one of only two black women Zen Senseis, or teachers, she applies wisdom teaching to social issues and is a leading voice for Transformative Social Change. In recognition of her work, angel Sensei received the first Creating Enlightened Society Award from Sakyong Mipham Rinpoche. Both fierce and grounded, she is known for her unflinching willingness to both sit with and speak uncomfortable truths. angel notes, “Love and Justice are not two, but one. Without inner change, there can be no outer change. Without collective change, no change matters.” Whether in writing, teaching or speaking, her voice is unique. This looks like a very interesting talk, but I can’t get it to play beyond the first 7 or 8 minutes. Please help. Audio link doesn’t seem to work for more than several minutes. Same here, after a few minutes the recording slips back to the introduction of the talk. Audio stop working after a few minutes and goes back to the intro of the talk. I’d really like to hear this if you can find the whole thing. Thank you. I tried several combinations, and Apple apps done’t work. I had to use direct link to SF Shambhala Times on FireFox, and mailed on Apple Mail. Thanks, Sarah, for your research, and useful suggestion. Was that able to work, Chris? I am sorry about this! We thought it was working just fine.